Disclaimer: Before I jump right into matcha latte recipes (and how on earth I survived a week without coffee), there's something I'd like to get off of my chest: I love coffee. And in a perfect world, I'd like to think coffee loves me back. However, as I've recently realized with a razor-sharp tinge of heartbreak, it doesn't. Which is frustrating. Ever since my first years of college (back when our relationship was still sprung and spicy), I've given coffee everything: my loyalty, my paycheck, my very best coffee mugs, and probably the most impressive—my undivided attention first thing when I wake up in the morning. And while there were some warning signs over the years—midafternoon meltdowns, headaches, jitters—I really thought we were in this for the long haul. AKA I never thought I'd trade in for the grassy likes of matcha. It's not that I had any type of problem with the pretty green powder, but after having a sip of my friend's matcha latte here, a taste of a matcha-infused croissant there—I live in L.A.—I just didn't think the drink was for me. That being said, I reached a sort of epiphany a couple weeks ago when I went completely rogue and somehow managed (unintentionally) to go three days sans even one sip of joe. I'm honestly not sure how it's possible to physically not have time for coffee, but apparently, it is and it happened. And while I did expect the headaches, I didn't expect the blissful state of anxiety-free living that also followed suit. Nope, I was stupefied, to say the least. So after mulling it over and looking over my matcha-filled Instagram feed, I decided to conduct an experiment. Amid my hot and heavy relationship with coffee (cold brew, Arabica drip, frothy mochas—I don't discriminate), I came up for air six days straight and replaced my daily fix with a brand-new matcha latte recipe instead. And interestingly, it was 100% successful. Sure, over the six-day span I missed my coffee, but I slowly discovered my addiction had more to do with a craving for something ceremonial and delicious each morning than the coffee itself. And although the bump in energy wasn't quite as electric as a velvety cap, I found myself feeling grateful for the switch-up come three, four, or five hours later when I didn't feel the need to take an impromptu nap at my desk or stuff fistfuls of fruit snacks in my face. The key takeaway: My blood sugar, energy, and overall anxiety levels felt far more stable than they had in years. And thanks to the deliciousness of the matcha latte recipes I tried (stay tuned), it didn't feel at all sacrificial. In preparation of the experiment—and because I was nervous and desperately trying to motivate myself to follow through with the plan—I reached out to six different experts (from a holistic nutritionist to Tove Lo's personal dietitian to an industry-leading collagen brand to an organic meal delivery service) for their own personal go-to matcha recipes. Yep, in addition to actually drinking a matcha latte each morning, I was also committing to making one—no coffee shop pit stops allowed. (And honestly, I think stocking up on the ingredients made me 100% more accountable.) So if you've been feeling a bit dependent on your coffee lately or are simply interested in six days worth of obsession-forming matcha latte recipes, you've come to the right place. Keep reading for the all-star recipes from my week sans coffee and a quick matcha refresher course as a helpful appetizer. Cheers! If you're considering making the move to matcha but only know that it's green and supposedly good for you, here's a crash course courtesy of Courtney Swan, self-proclaimed "real food activist on a mission" and personal nutritionist to singer Tove Lo. (In other words, she's basically the coolest person ever.) "Matcha is green tea leaves that have been ground into a fine powder to be used directly to make tea—no bags or strainers required," explains Swan. But here's what makes it so special and different than your average cup of Lipton: "This deep-green powder is made from the leaves of a high-quality shade-grown bush called tencha, which are sheltered from direct sunlight, therefore reducing photosynthesis and slowing down the growth of the plant. Ultimately, this is what creates that signature rich green color and stimulates chlorophyll production to magnify the tea's health benefits and nutrient quality." Therefore, matcha is extremely rich in polyphenols, L-theanine (a compound that helps with stress and anxiety), fiber, potassium, and chlorophyll. All of which have impressive health benefits like free radical–fighting antioxidants, higher metabolism, and improved detoxification, concentration, mood, and anxiety levels. In fact, as Thistle's resident nutritionist, Hayley Vetras, point out to me, it's one of the most potently rich superfoods in the world: "Just one cup of matcha green tea provides over five times as many antioxidants as any other food; 6.2 times that of goji berries, seven times that of dark chocolate, 17 times that of blueberries, and 60.5 times that of spinach!" 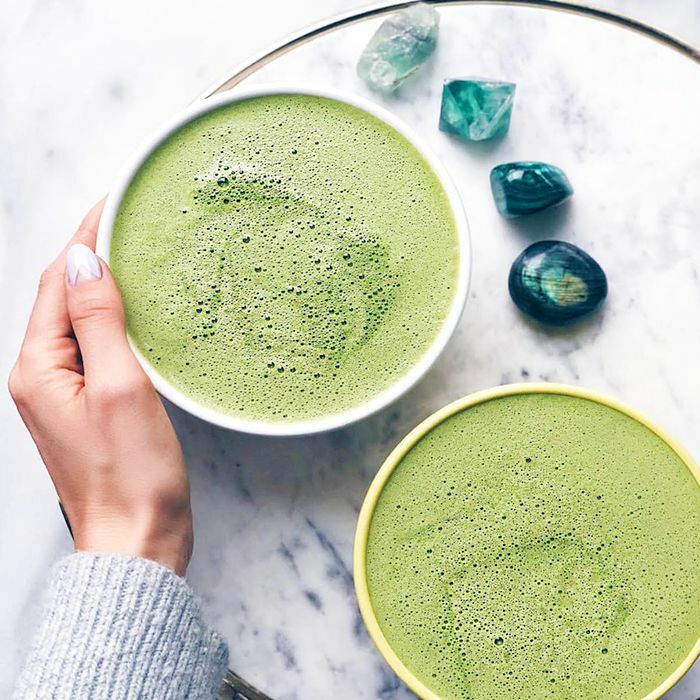 Superior satiation: According to holistic nutritionist Elissa Goodman, matcha may also help curb your appetite and calm food cravings. "Matcha helps to prevent the cravings that can come with the spikes in insulin and glucose levels that coffee can cause," she tells us. "Additionally, the antioxidant EGCG, found in high levels in green tea, stimulates your nervous system to release fat as fuel, which improves energy and fat burn." Crash-free caffeine: "When matcha is absorbed, the catechins found in it combine with its caffeine molecules, increasing the time it takes for caffeine to break down in your bloodstream. This leaves you with prolonged energy free of coffee's inevitable and abrupt crash," says Goodman. However, it's worth pointing out that if you're used to the stereotypical jolt of coffee, you may want to amend your expectations. "If you're replacing coffee with matcha, you will probably notice a difference in the energy you get from matcha," Swan points out. "Thanks to its calming effect, you won't get as much of a jolt as you do from coffee, which some people don't like, but I find it still gives a good boost of clean, less aggressive energy." Detoxification prowess: According to Vetras, the high ratio of chlorophyll helps to detoxify cells in the body and maintain the alkalinity of blood and tissues. "Matcha will also naturally remove heavy metals and toxins from the body specifically within the colon walls and liver," she continues. Brain health: "Due to the amino acid L-theanine, matcha helps keep the brain alert while inducing relaxation," Vetras tells us. "It also reduces stress levels, lowers blood pressure, PMS symptoms, and antioxidant activity in the brain. It's a natural production of dopamine and serotonin, which keep the blues away, improves memory function, and promotes better concentration." It's an awesome alternative: "I find matcha hard to compare to coffee because I think it's really dependent on the person," says Swan. "Organic coffee is really high in antioxidants and studies show it is really beneficial to our health, however, not everyone can handle coffee. Especially those with anxiety disorders or burned-out adrenals. Matcha is a great alternative to coffee for those who can't drink it." Which is exactly why Jordan Younger, creator of The Balanced Blonde and host of the Soul on Fire podcast, is a fan of the drink. "Everyone's body is different, so I am always hesitant to say whether one thing is healthier than the next. Personally, my body tolerates matcha so much better than it does coffee. At first I was disappointed when I had to cut coffee out of my life after learning I'm highly allergic to it. But I do think the clean caffeine in matcha is generally healthier and less addictive than the caffeine in coffee—it is much easier on our system. Even if you're a coffee addict, give matcha a chance, and it just may win you over!" Inspired? Keep scrolling for the four matcha latte recipes single-handedly responsible for getting me through a week without coffee—tears and drama-free. As someone who enjoys both warm and cold beverages in the morning (I flip-flop back and forth between hot, comforting lattes and refreshing cold brew), I loved Swan's take on the traditional matcha latte recipe. Plus, thanks to the natural fiber boost from the banana, my morning hunger was curbed more than usual. Optional: If you forgo the banana, Swan recommends sweetening with a little monk fruit or stevia to keep your latte sugar-free. Notes: "My morning matcha latte recipe is really simple," says Swan. "I like to drink mine cold and sweeten it with half of a frozen banana. I simply throw all the above ingredients in my Vitamix and blend until smooth." Goodman says her satiating matcha latte recipe "isn't for the faint of heart," so I was a tad nervous before taking it for a spin in my blender. As someone who has never fully jumped on the Bulletproof wagon (aside from Kreation's insanely delicious bottled version, which I'm not sure entirely counts), I didn't really know what to expect. However, I was actually pleasantly surprised with the overall taste and consistency (hence, why this one made my final roundup). Notes: "Add all ingredients to your blender or Vitamix, blend until smooth and creamy, and then heat on stovetop or in the microwave. I recommend one cup of matcha green tea to jump-start your day or as a great substitute for your afternoon caffeine cravings (you don't have to say goodbye to coffee for good—just mix it up for best benefit and you may find that you end up preferring matcha!)." It doesn't matter what time of year it is—I love anything with pumpkin. (No, seriously, I've been known to make pumpkin pies in the dead of summer.) So you can imagine my excitement when Younger shared her go-to matcha latte recipe with me and it had my all-time favorite ingredient: pumpkin pie spice. Plus, thanks to the addition of coconut butter, this was by far the creamiest recipe I tried all week. Notes: "Heat the coconut milk on the stove or in the microwave and melt the coconut butter if you want it to blend smoothly. Add all ingredients into a high-speed blender, and blend until smooth. Enjoy! I like to have this first thing in the morning and then have breakfast about an hour or two later." As someone who is completely devoted to my morning collagen ritual, I was ridiculously excited to try the new kid on the collagen block: Vital Proteins Matcha Collagen Powder ($49). (Especially after Younger had previously sung its praises to me.) So naturally I reached out to the brand to find out how they recommend I prepare it. Spoiler: It was delicious, and thanks to its non-saccharine sweetness and velvety texture, it's a great option for those who are new to matcha. (It was probably the sweetest matcha latte in the bunch.) Oh, and I also tried this recipe iced (simply don't heat the coconut milk!) and it was just as addicting. Notes: "Blend the three together and enjoy. It's a great drink to get the morning going, loaded with nutrients from matcha, healthy fat from the coconut milk, and all the great benefits of collagen," explains Traci Danielson Mitchell, director of education at Vital Proteins. 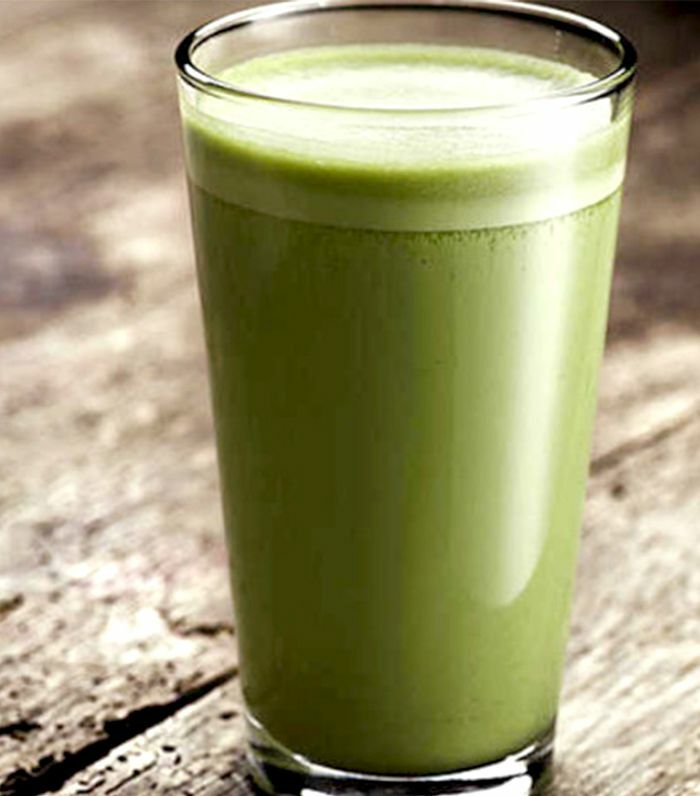 Though I really loved Goodman's powerful matcha latte recipe, she's 100% correct in that it's not for the faint of heart, and if you're new to the Bulletproof thing and don't generally take oil in your morning beverage of choice, it can be an acquired taste—or at least a taste that takes some gradual getting used to. Personally I was into it, but if you'd rather build your way up to the larger portions oil and butter, CEO of Model Meals Danika Brysha's matcha latte recipe is a delicious stepping stone: warm, so frothy, and a little easier on the stomach. Notes: "Add all ingredients to a blender and then blend until frothy. If you're new to MCT oil and ghee, I recommend starting with a 1/2 teaspoon (or less) to avoid an upset stomach," Brysha tells us. I've had a love affair with the L.A.-based organic meal delivery service Thistle for a while now and just can't seem to quit my subscription habit (although it's a healthy one, so I don't mind). And as it so happens, one of the most popular beverages in its enchanting lineup (appropriately named "Jade") is infused and inspired by the many health benefits of matcha. So I obviously had to get the brand's hormone-balancing recipe for my experiment. And although I've previously been committed to its "Latte" (a dreamy mixture of cold brew, almonds, vanilla, cinnamon, sea salt, and dates), I've officially converted to the brand's matcha take. Notes: "Before blending all the ingredients together, sprinkle in your choice of adaptogen for a powerful punch—we recommend a teaspoon of reishi, ashwagandha, or cordyceps to balance hormones and calm anxiety," Vetras suggests. Are you a matcha latte lover? Share your go-to recipe with us below!